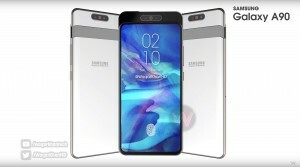 Yesterday we saw concept renders of the Samsung Galaxy A90 which showed its wild design. Today, we are looking at the alleged key specs of this smartphone. 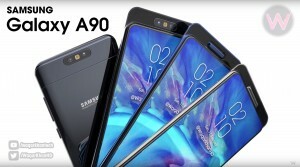 According to the information coming out of China, the Galaxy A90 – which might also be called Galaxy A80 – will be powered by Snapdragon 7150 SoC – a successor to the Snapdragon 710/712. 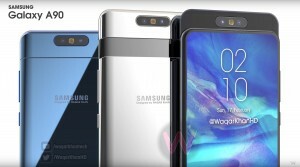 The smartphone will flaunt a 6.7-inch Full-HD+ (2400 x 1080 pixels) OLED display equipped with sound casting technology. This will eliminate the need for an earpiece and allow a little more space for the screen. The Galaxy A90 will come with a slider housing the triple camera setup consisting of 48MP (f/2.0), 8MP (f/2.4), and ToF (f/1.2) modules. These cameras will rotate allowing them to be used for selfies and video calls. 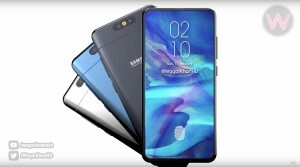 The Galaxy A90 will weigh 219 grams and measure 76.5 x 165.0 x 9.0mm. It will ship with a 3,700 mAh battery with 25W fast charging support. Do note that this information can’t be verified so it might contain some errors. Samsung has scheduled an event on April 10 where it is expected to announce the second wave of Galaxy A smartphones. We will hopefully know more about the A90 next week.